When I moved away to college I fit every single thing I owned into a toyota corolla. It was packed to the brim and there was barely room for me to fit in the driver's seat. A lamp was sticking out the window, a laundry basket filled with shoes was jabbing at my shoulder, and clothes and books were jammed in haphazardly. I remember my dad looking at the car and saying, "You have too much stuff, Bopper, if you can't fit it all into one car." That stuck with me in the way that very casual, passing remarks sometimes do to unsuspecting victims. My mind molded itself around this idea that the perfect amount of "stuff" for one person's life became whatever can be fit into a four door mid sized car. And every time I moved in college and before marriage, I kept myself in check. "Can I fit it all into a corolla and just drive away with my life in the back of the car? Yes? Then I have just the right amount." Of course when you get married and have to have an entire kitchen and living room and furniture that idea goes out the window. I still felt like, though, Greg and I were able to keep our "stuff" to a minimum. Before we bought our townhome we always lived in a one bedroom apartment. We kept everything we owned in that apartment and shared a closet. Every time we moved we did a huge gutting. It felt good to be constantly discarding so many unwanted items. Like shedding weight or letting go of grudges you've held on to for too long. Good bye ugly shirt! So long rice cooker! Never wanted you 5 lb weights! When you have a baby any hope of your stuff being fit into one car is officially lost for time and all eternity and I guess maybe that is where I began to give up in my conquest of stuff? It certainly doesn't help that now live in a three bedroom house with closets galore and a laundry room and an entire unfinished basement where stuff crawls into corners and multiplies and replenishes and finds empty shelves on which to live and spread and take over. The other factor that has exacerbated the whole stuff issue is that our precious Junebug is a master stuff finder. She should be a private investigator when she grows up. She finds scarves and tampons and glittery body wash that I last used when I was 13. She spreads it out all over the house in an artistic fashion that only Pablo Picasso himself would truly appreciate. Everywhere I go I am tripping all over Greg's and my stuff. I gather it all up, throw it back into overflowing drawers and then the next day it is delightfully in the hallway again. 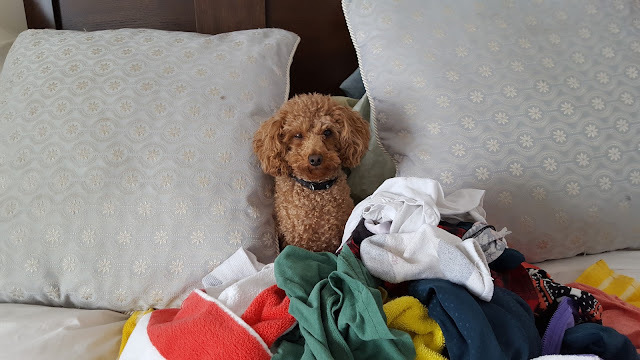 Saturday morning I had finally had enough with our many clothes being all over the floor and the baskets of laundry never being empty and where did the socks, the notebooks, the DRAWERS FULL OF LOTION come from? I was done with our shelves being so full that June could have her way with them and leave Greg and I the victims of her frenetic toddler rage. So I started to purge. I started in our master closet. I had three baskets- one for dirty laundry, one to give away, one for trash. I went through every piece of clothing, every random pair of boots I wore four years ago. I tossed, I folded, I trashed. Then it was on to the bathroom. I sorted through used razors and dead sea salt lotion and SO MANY TRIAL SIZES OF SHAMPOOS AND CONDITIONERS. Everything found a place and most things found a garbage. Next it was the bedroom drawers, the night stands, June's bathroom drawers (I mean, I am really glad I have held onto the little sponge bath cloths they gave me for newborn June 21 months ago!) and June's closet. If you thought organizing an adult's closet was bad, just wait until you deal with a baby. Her wardrobe completely turns over ever 3-6 months! It's an organizational nightmare! I mopped floors, swept, washed the sheets, folded laundry, and about seven hours later I collapsed on the floor in exhaustion. But in the process I had thrown out two huge bags of garbage and filled two laundry baskets with stuff to give away. Stuff! Stuff that was officially no longer mine to stress me out. In my cleaning rage I tried to figure out why I had such a personal vendetta against all this stuff. Why was it bothering me so bad? I don't have clear answers, but I have some ideas. I'd like your input. 1. The idea of having hidden messes is unnerving to m. I don't like random things in desks and in drawers and stuffed into closets. I know it's there. It taunts me while I sleep. I do not know why this is, but the more stuff is around me (even if unseen) the less relaxed I feel. 2. Clutter stresses me out. I don't like to have a lot of stuff in places where I can see it. I want everything to have a place unseen--- in a cupboard, drawer, closet or somewhere where I don't have to look at it. When I do open those cupboard, drawers, and closets I want to know how to quickly and easily find what I need and I don't want to be accosted by aggressive overflowing stuff. 3. I feel a lot of guilt associated with stuff. Especially stuff I don't use or wear. On Saturday I barreled through lots of clothes that I used to wear, but don't anymore. For some reason this made me feel guilty. As if when I buy a blouse I make a lifetime commitment to have, hold, and cherish that shirt forever. My mind knows this is ridiculous, but my heart is weird and still feels guilt. I found lots of foot creams that I would maybe use in theory, but don't. There were shirts that I didn't want to give up because at one time they had meant something to me or because they look great if I iron them but I hate to iron. I felt like I should keep this stuff, but keeping it only equips me with tremendous guilt. So I placed it into baskets to give away. 4. Moving forward, I want to be much more deliberate with the things I buy and only buy what I NEED and what I LOVE and not stuff that I kind of like and definitely don't enjoy. The idea for me in its most basic form is that the less stuff I have, the more free I feel. That's not to say that there is not some stuff that I don't truly enjoy. But I want to have less stuff and love the stuff I do have. A quality over quantity type thing. P.S. A friend suggested I read The Life Changing Magic of Tidying Up. Have any of you read it and enjoyed it? P.P.S. I apologize for the ridiculous amount of times I used the word "stuff" in this post.